Tired of boring life and want to go for a vacation but where? I am also a working lady, like a normal person I love to go for a vacation to pamper myself, to give myself some leisure time, away from job and only my love to travel make it possible. So I planned to visit Manali and Rohtang. I must say, a beautiful place to visit at least once in your lifetime. Lovely weather with mesmerizing views, my fascination for mountains make me choose hilly areas for a vacation. 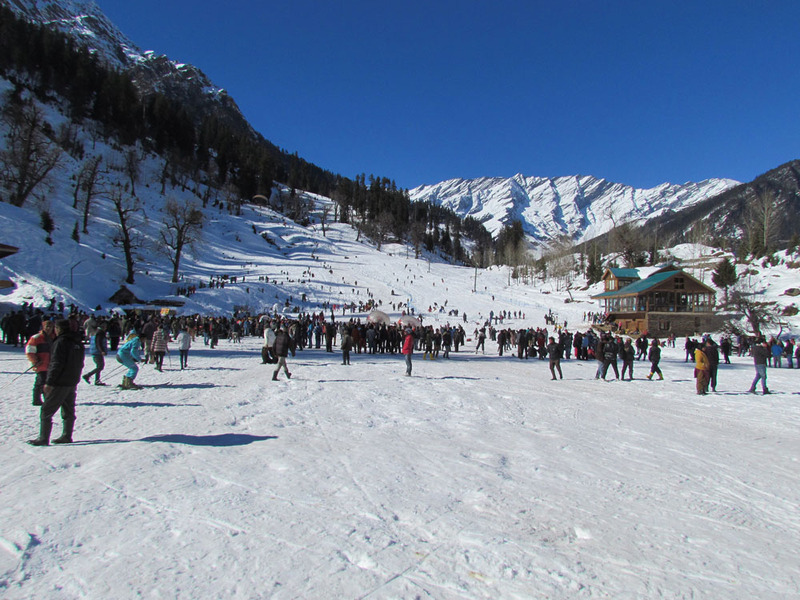 While planning your trip to Manali make sure you travel in night and save your day time for sightseeing. So that you can enjoy splendid views of river (Vyas). River Vyas is flowing all the way through Manali. A peaceful place to sit back and relax. One can also enjoy river sports here like river crossing and river rafting. Take a pause from your journey and spare some time to sit beside and enjoy nature’s beauty. To give yourself some personal time is also very important, to know the real you. For me running water defines that nothing is constant in life. Divide your days according to your visits, so as we did. Best place for adventurous lovers. One can enjoy various sports here like Cable car, Ropeway, Helicopter Ride, paragliding, skiing, and snow scooter. Else enjoy making sculptures in snow. Also known as Hidimba temple, made of wooden and built around a cave where it is believed that devi Hidimba performed meditation. Surrounding covers a huge garden named cedar forest. The temple can be reached on foot (3km walk) from manali, is also famous for Hot Water Pond, where naturally hot water comes from earth throughout the year. It is believed that Vashist hot water heal many skin diseases. A best place I had ever visited. Rohtang pass is on height of 13,050 ft, The same connects you to Leh. Carry your good pair of woolen clothes otherwise be ready to freeze.. Yes the temperature of Rohtang pass is quite freezing. You can hire a day cab or mini bus to reach Rohtang pass. Beautiful scenes passes throughout the way to Rohtang. I wish to be there once again..
How a trip can ends without shopping. Take away some popular Manali goodies with you from main market of manali, shopaholics can enjoy roving around mall road and can explore variety of shops. Shopping tip- Prefer to shop woolen clothes from Manali mall road, as woolen clothes are available there in variety and good quality. Overall place is good to visit. Be aware from fraudulences, people there will try to mold your mind towards unnecessary things, bargain hard as we are Indians bargaining is in our blood. Best time to visit November to February. Go for a vacation not because – for a while you haven’t visited anywhere but to spend some precious time with your family and friends, it will make your bonding strong and will bring you closer. A trip will help you recognize your real friends and favorite family member.. Trust me you will definitely get to know different faces of different people, not so good friends will become dear ones and ones we took for real will show their true colours. Best way to know persons is to spend some time with. So enjoy and have fun.. Very well written Neha…way to go! You have covered more than most but could you throw some light on accommodation charges. I stayed in a kinda htel woth apple orchard which cost me 1K per night. What about you? How was it in Manali…did you stay in the old one or the new one? Even I don’t like New Manali, thank God I visited Rohtang Pass and ended up with up great memories. No, I didn’t take the Yak ride instead I have done mountain biking at Rohtang pass. Visited Manali in December first week and the overall budget of three-day trip was 4500 including travel, food, sightseeing. I would not recommend staying in New Manali rather choose old Manali for a stay. Informative! I am planning a visit to Manali and mcleodganj this December. I am confused about which date should I pick? You can visit Manali in the first week of December, and if you want to see snow fall then visit in mid or end of the December. Yes, Manikaran is in kasol.